This will list the requirements to get the characters Lv. 10 weapon as well as strategy if one is needed, these are an alternate method compared to the vanilla version if you can do mixjoy you can choose which method to do. The characters weapon must be Lv 9. The difficulty must be set to Hard or Expert. Requirement: Defeat Cao Ren, Xu Huang, Cheng Yu, Xu Zhu & Xiahou Yuan in under 5 minutes. Cheng Yu is Xu Zhu's sub-officer so make sure you kill him before he runs away if you beat Xu Zhu before him. Requirement: Get 150 KOs in under 4 minutes. Requirement: Do not have any of Cao Cao's units clear the Chang Ban Bridge while defeating all enemy officers. Requirement: Defeat Yue Ying 6 times, each time quickly enough to get a "won by a wide margin!" message. Suggested Items: Orb: Ice, Power Rune, Tiger Amulet, Wind Scroll, Elixir, Secret of Orbs + your choice. A "won by a wide margin!" message will happen if you take less than 2 minutes to defeat Yue Ying in each appearance. Requirement: Defeat 4 enemy officers in under 4 minutes while killing less than 15 peasants. Suggested Items: Power Rune, Tiger Amulet, Tortoise Amulet, Peacock Urn, Bodyguard Manual. One of the few stages where bodyguards are useful as KOs they get do not count towards yours. If you are in a group with peasants you will want to wait for your bodyguards to defeat them so you don't accidentally do it. If you get the cutscene with Liu Bei from killing too many peasants you will lose the weapon. Alternatively you can get player 2 to do the requirement as the KOs against peasants only count for Liu Bei. Requirement: Get 300 KOs in under 5 minutes. Requirement: Get 100 KOs in under 6 minutes & 35 seconds. Shooting Guan Yu off of his horse is not required. Requirement: Defeat Cao Ren, Zhang He, Xu Zhu & Xu Huang. Requirement: Get 50 KOs in under 4 minutes. Requirement: Get 100 KOs in under 3 minutes. Pang Tong's favor doesn't matter. Requirement: Defeat Zhang Fei, Huang Zhong & Ma Chao without losing any Juggernauts. Don't go too far ahead or an enemy task force will spawn, this can be really bad if you happen to be locked away from the Juggernauts. Requirement: Defeat Cao Xing before he retreats and get 50 KOs before Yuan Shu appears 5 minutes into the stage. Requirement: Defeat Dian Wei twice. Weapon message happens when Dian Wei arrives the third time. The damage from plundering and amount of enemy Supply Captains successfully delivering their supplies doesn't matter. Requirement: Before Xu Huang appears as reinforcements defeat all officers except Guan Yu. Xu Huang has 2 conditions for appearing 1 being Zhang Fei being alive for more than 10 minutes, the other being if any ally officer gets defeated. Requirement: Get 400 KOs before Xiahou Dun arrives. The more enemy teams that pass the earlier Xiahou Dun will arrive, recommended to use an Elephant to block part of the gate that you are able to keep in view as it will not work if off screen. Requirement: Defeat Ling Tong, Xu Sheng, Gan Ning & Lu Meng before Zhou Tai normally appears. Gan Ning appears on the right side of the stage when 2 minutes have passed while Lu Meng appears on the left at 2 minutes 40 seconds. Zhou Tai appears at 4 minutes 30 seconds into the stage or if all other Wu officers are defeated before that point. Requirement: Trigger the rain via troop killing and defeat Wei Yan in under 2 minutes & 30 seconds of it happening. Suggested Items: Power Rune, Tiger Amulet, Wind Scroll, Elixir, Master of Musou + your choice. I don't mention a KO count which would be 26 due to the fact that if you use your Musou there is the chance that some enemies will get knocked into each other which will result in a kill that isn't added to your counter, rain will automatically happen if 5 minutes pass. You will want to save when the rain starts as Wei Yan can be quite hard to deal with. After getting the weapon message you can choose to grab your horse (Shadow Runner recommended) and finish by going to the retreat point. Requirement: Defeat Guan Ping, Zhou Cang & Liao Hua in under 2 minutes. Requirement: Defeat Guan Xing in under 4 minutes. Requirement: Choose your side, defeat all officers and sub-officers. Requirement: Defeat Gan Ning & Han Dang in under 3 minutes. Requirement: Defeat Mi Zhu, Sun Qian, Zhang Fei & Guan Yu before Zhuge Liang's ship docks (3 minutes). Requirement: Meet with Huang Cheng Yuan in under 6 minutes. 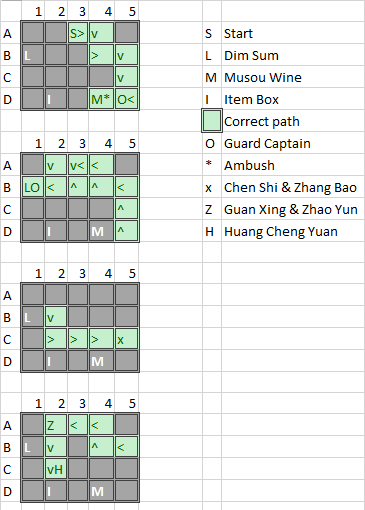 Requirement: Defeat Chen Heng or Yu Mi with more than 6 units remaining. Requirement: Defeat Cheng Pu, Pan Zhang, Xu Sheng & Ding Feng within 1 minute of encountering them. Requirement: Defeat Hua Xiong, Hu Zhen & Lu Bu in under 5 minutes. Defeat Yue Jin in under 2 minutes & 30 seconds. Defeat Li Dian in under 2 minutes & 30 seconds from when he appears. Requirement: Defeat Zhou Cang, Liao Hua & Guan Ping. Guan Yu gets enraged. Suggested Items: Tiger Amulet, Wind Scroll, Tortoise Amulet, Elixir + your choice. Requirement: Get 80 KOs in under 5 minutes. Yue Jin & Li Dian are not required to be defeated for this. Requirement: Defeat all Gate Captains in under 5 minutes without being discovered. While the Gate Captains will respawn you only have to defeat them once. For the Gate Captain near Zhou Tai wait for him to start patrolling so you can move down and defeat it then move North of Cheng Pu without getting spotted when Zhou Tai makes his return trip. For the Gate Captain by Ling Tong if he is inside wait for him to leave by being in the South space near it then defeat it, Lu Meng will head for it so go North and not get detected by him or Ling Tong and make your way to the final Gate Captain. If you get detected, but are able to defeat the last Gate Captain before the dialogue finishes you will get the weapon. Once the weapon message appears if doesn't matter if you get caught. Requirement: Defeat the real Yu Ji in under 3 minutes. It is okay for the real Yu Ji to dissappear once, having the item Art of War is recommended so you can use the War God Axe effect for a full minute and abuse the the Imperial Seal to deal loads of damage to the real one when he returns. The real Yu Ji will run away if he got hit and wasn't defeated within 10 seconds. Requirement: Defeat the 3 Loyalists' prior to the rockslide trap in under 1 minute of their appearance. If Sun Ce kills a Loyalists it will not count. Requirement: Defeat Xiahou Dun, Xu Zhu, Dian Wei & Cao Ren the first time in under 7 minutes. Requirement: Rescue Sun Quan in under 3 minutes. Requirement: Do not get detected before defeating Dong Zhuo, afterward defeat any 4 officers. The patrol has bad depth perception due to the darkness so you can walk pretty close without them spotting you, though if they do notice make sure you run away from where they patrol, the minimap is great to use during this to stay out of their range. Requirement: Defeat all the Eunuchs & Yuan Shao. You don't need to defeat Yan Liang or Wen Chou. Requirement: Defeat all generals before Gongsun Zan arrives. Yuan Shao's prestige doesn't matter, also if Zhang He or Tian Feng defect you do not need to defeat them to get the weapon. Requirement: Get 100 KOs in under 4 minutes & 30 seconds. Requirement: Get 300 KOs in under 4 minutes. Suggested Items: Orb: Vorpal, Tiger Amulet, Wind Scroll, Tortoise Amulet & Charge Bracer. This is easier than is sounds as enemies will tend to go for you. This setup allows for good KOs via C6 with full musou to get hopeful Vorpal procs, can switch Charge Bracer for Art of War if you feel power ups drop often enough. You have to defeat Taishi Ci at the bridge after rescuing Sun Quan. If doesn't matter if the sub-officers die as long as you go for Taishi Ci after rescuing Sun Quan. Requirement: Choose your side, get 100 KOs in under 5 minutes & 15 seconds. Suggested Items: Tiger Amulet, Wind Scroll, Tortoise Amulet, Art of War + your choices. Requirement: Get 350 KOs in under 5 minutes. Suggested Items: Power Rune, Tiger Amulet, Wind Scroll, Art of War + your choice. The timing can be quite tight, specially because of Huang Gai who is constantly near you as he can (and will) toss bombs which will take a good chunk of your health and knock away troops if he isn't knocked off of his horse. You will want to get at least 200 KOs around Hua Xiong & Hu Zhen before going to where Lu Bu is to get the final amount, Shadow Harness is recommended. Requirement: Defeat Xu Huang, Cao Ren, Xun Yu, Xiahou Dun & Xiahou Yuan in under 5 minutes. Suggested Items: (Spear 1 & 3) Power Rune, Tiger Amulet, Wind Scroll + your choices. (Spear 2) Power Rune, Horned Helm, Tiger Amulet, Elixir + your choice. Xun Yu is Xiahou Dun's sub-officer so make sure you kill him before he runs away if you beat Xiahou Dun before him. Suggested Items: Tiger Amulet, Wind Scroll, Tortoise Amulet, Elixir. This is exactly the same as Lu Meng's weapon. Start the stage on Hard or Expert and make a save immediately, go to the options and change the difficulty to Beginner and start a different stage with any character. After the stage has loaded in battle soft reset (Start+Select) and go back and continue to your original save, enemies will now be more passive.